Khadro-la (Rangjung Neljorma Khadro Namsel Drönme) with some of the nuns of Dorje Pamo Monastery. 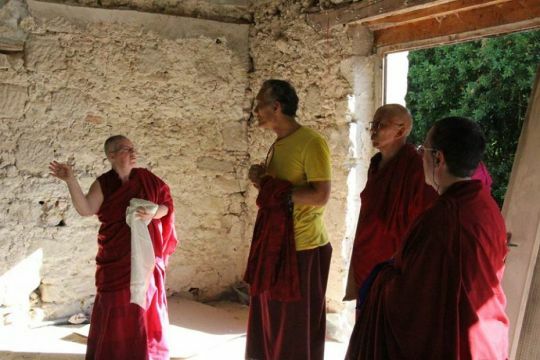 Dorje Pamo Monastery is in the process of becoming a new nunnery for approximately twelve FPMT nuns in the South of France. The Supporting Ordained Sangha Fund was pleased to offer US$93,760 toward the building of a gompa, reception area, offices, and library. Funding for renovating the nuns’ quarters was secured from other sources. 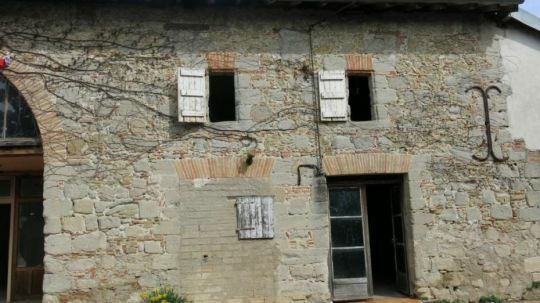 Due to past fire damage, and the need to expand residential accommodations, renovation work must be completed before this is a functioning nunnery. The property has the potential to accommodate 15 or more nuns. Dorje Pamo Monastery nuns show Yangsi Rinpoche around the facilities during an August 2018 visit. Photo courtesy of Dorje Pamo Facebook page. 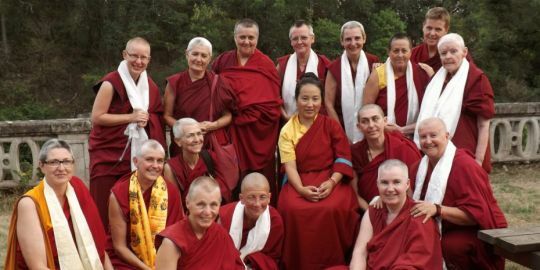 FPMT monks and nuns are collectively known as the International Mahayana Institute (IMI), which has more than 300 monastics, and among them 180 nuns, of which approximately 60 are European. There is much need for a monastic community for IMI nuns in Western Europe. The gompa building of Dorje Pamo Monastery. The new Dorje Pamo Monastery is located 5 miles [8 kilometers] from Nalanda Monastery, where both a Basic Program and Master Program are taught, making it easy for the nuns to join the study programs there. There is a critical need for monastic communities to provide a proper environment where nuns can live according to their vows, practice together, pursue their education, and receive care. Lama Zopa Rinpoche has said that without proper monastic communities and discipline, it will be very difficult to preserve and spread the Dharma. We are very happy to be able to offer support to this new monastic community. Please stay tuned for news on the official opening of this nunnery and also progress on the renovation. All are welcome to help bring this beneficial project to fruition. The outstanding students of Tashi Chime Gatsal Nunnery received prizes in recognition of their achievements. Since 2009 sponsorship has been offered to the nuns of Tashi Chime Gatsal Nunnery, Nepal. Funds have been offered to complete two 100 million mani retreats (100 million recitations of the mantra OM MANI PADME HUM) every year. 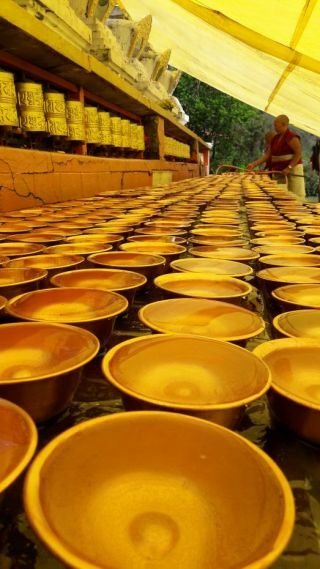 In addition to the 100 million mani retreats, offerings are made to cover the cost of food for all during this period as well as an offering for a qualified geshe to stay during the retreat in order to give lamrim teachings. Additionally, a grant was offered to the nunnery for much needed new accommodation in 2014. During Saka Dawa the nuns engaged in eight sets of nyung nä retreats for universal peace and for the long lives of our their teachers, friends, and supporters. They have recently completed the first 100 million mani retreat of the year and are now engaged in the second. Over the past nine years the nuns have completed seventeen 100 million mani retreats. Please rejoice! You can read more about the incredible achievements and dedication of these nuns. By offering any amount to the Supporting Ordained Sangha Fund you enable support to this nunnery to continue. 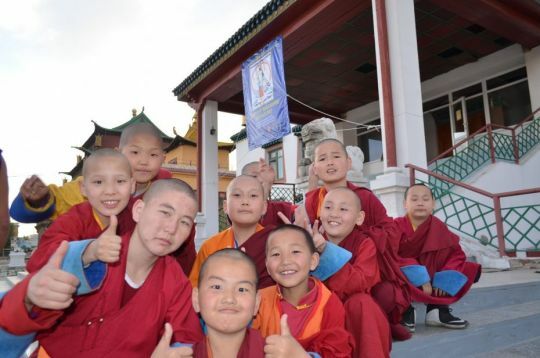 The young monks of Idgaa Choizinling Dratsang. The Supporting Ordained Sangha Fund offers sponsorship of daily lunch for the young monks studying at Idgaa Choizinling Dratsang in Mongolia. Recently US$9,000 was offered to cover May 2018 to April 2019. Idgaa Choizinling was established in 2003 through Ganden Do Ngag Shedrup Ling due to the kindness of many benefactors. Idgaa is strongly connected to Sera Je Monastery in India and serves as a focal point of Buddhist learning in Mongolia. Since its inception, FPMT has been offering food to the monks studying there. 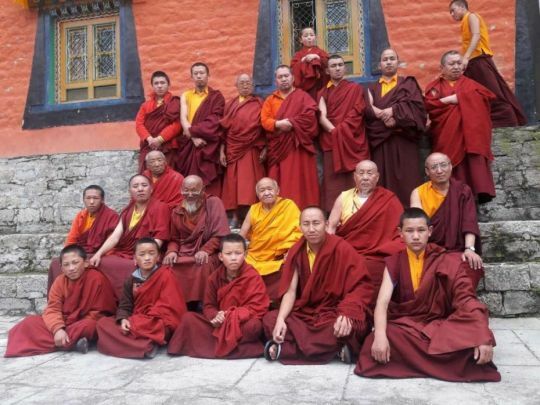 The monks of Idgaa Choizinling Dratsang. 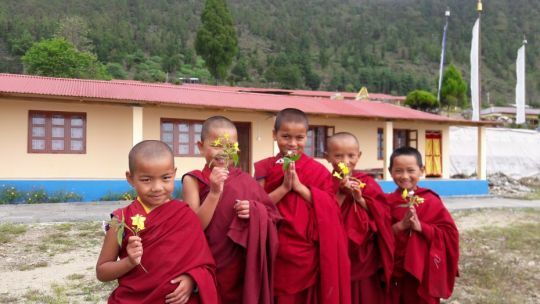 The Supporting Ordained Sangha Fund supports ordained monks and nuns as well as monasteries and nunneries by providing sponsorship for food, accommodations, educational needs, and health care for Sangha. 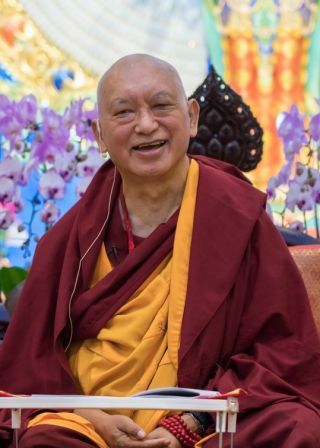 As Lama Zopa Rinpoche recently commented, “By offering even to one Sangha, whatever you can — even one dollar, one cup of tea, one piece of bread — there is much merit. And when it is to larger monasteries where there are several thousand monks, it is unbelievable merit. Please rejoice in this offering of daily food to these earnest monks who study and practice so sincerely to keep Buddhism alive in Mongolia. Posted in Ordained Sangha, Social Services. The nunnery was devastated by the 2015 Nepal earthquake. 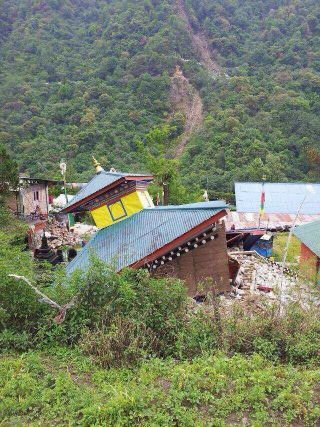 Shri Sengedrak Ngedhon Samten Choeling Retreat Center, a Kagyu nunnery, was badly damaged in the 2015 earthquake that devastated Nepal and surrounding areas. 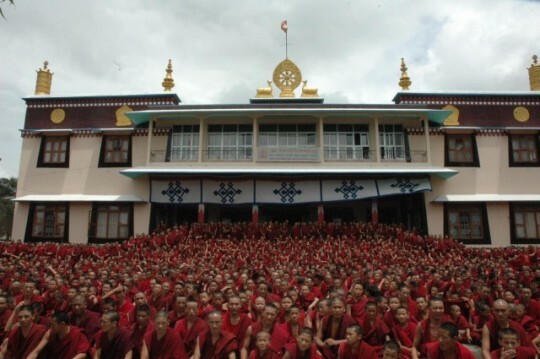 This nunnery, located on the border of Nepal and Tibet (on the Nepal side), is under the guidance of Zigar Monastery Abbot Tinley Dorje who is one of Lama Zopa Rinpoche’s teachers and has been offering Rinpoche precious oral transmissions for the past two years in Tso Pema, India. In 2017 Tinley Dorje requested that Lama Zopa Rinpoche support the rebuilding of this nunnery. The nuns had been living in temporary shelter in modest conditions. Following the earthquake, construction was needed for thirty-five retreat houses, one main prayer hall, a retreat house for the abbot, and five standard toilets. 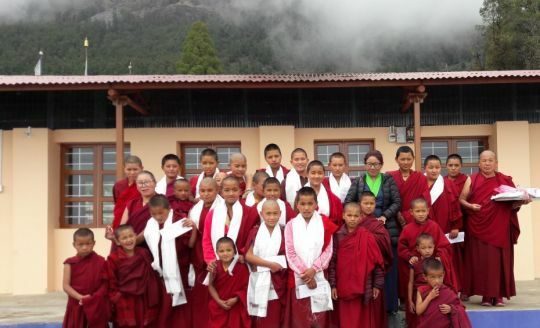 The FPMT Social Services Fund offered three grants totaling US$185,000 for the rebuilding of this nunnery. 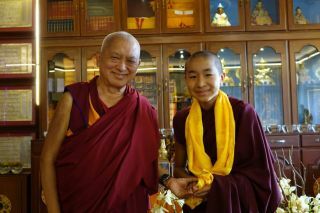 This is an incredible way FPMT can support ordained Sangha, and nuns in particular, who are not exclusively from the Gelug tradition. Kitchen and retreat house severely damaged by the 2016 earthquake. Sangha offering puja where the new nunnery is being built. I don’t have much to say but in short I want to request all the monks and nuns who are disciples of Kyabje Sendak Rinpoche [who founded the monastery and passed away in 2005] to practice according to what Rinpoche has advised. In order to attain enlightenment, practice the root of the path, guru devotion, by developing the faith of seeing Kyabje Sendak Rinpoche as the embodiment of the Three Supreme Jewels. With that single-pointed devotion, the actual action based on living in harmony and pure morality, practice according to Rinpoche’s teachings and thus get enlightened joyously without having any fear now, at time the of death, and in all future times and places all sentient beings, who have been our mother since beginingless lives and guided us with great kindness, into the state of enlightenment. 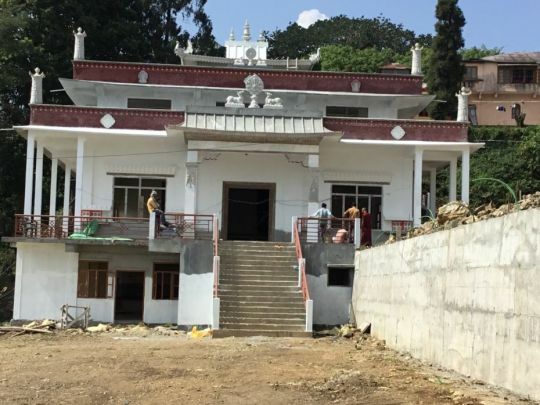 The new nunnery is under construction thanks to three grants from the FPMT Social Services Fund. To date, US$1,714,864.78 in grants has been distributed from the FPMT Social Services Fund toward rebuilding and disaster relief following the 2015 Nepal earthquakes. Thanks to a very kind benefactor plus funds offered from Lama Zopa Rinpoche personally, over US$73,000 was offered from the Supporting Ordained Sangha Fund toward a desperately needed new sewage system at Sera Lachi in southern India. Sera Lachi is made up of Sera Je and Sera Mey Monasteries. 6,000 monks study between the two monasteries. This grant contributes to making the environment at Sera Lachi clean, hygienic, safe, and conducive to thoughtful study for the Sangha on the grounds. This is just one way the Supporting Ordained Sangha Fund is able to offer support to thousands of monks at one time. Please rejoice in the funding of this important project which benefits the Sangha, the environment, and in turn, all who will receive teachings and guidance from these monks in the future. You can learn more about the Supporting Ordained Sangha Fund and the ways it supports monasteries and donate any amount to help ensure grants like this continue. Lama Zopa Rinpoche as a young student. 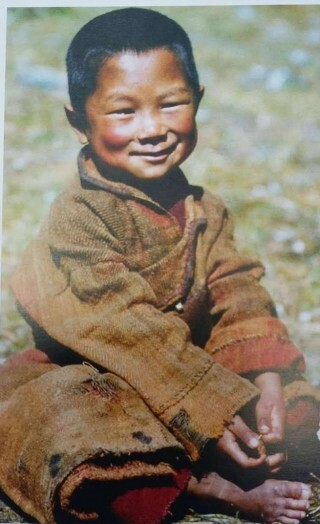 Rinpoche attended Rolwaling Monastery between the ages of 7-12. 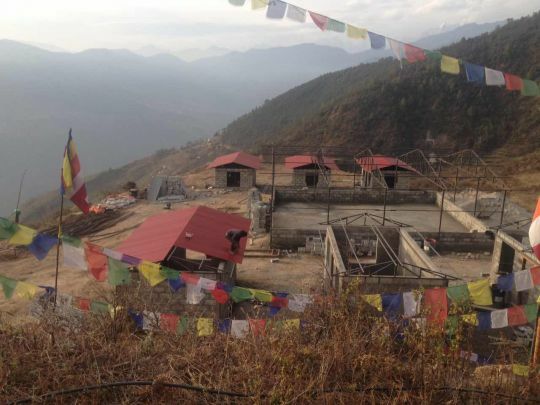 Thanks to a kind and generous donor, in 2016, a substantial grant was offered from the Supporting Ordained Sangha Fund to Rolwaling Monastery in Nepal, at the Tibet border, for the rebuilding of their gompa which was nearly destroyed in the 2015 earthquake. The buildings were already in poor condition (the gompa hadn’t been renovated since 1957), and the destruction of the earthquake proved too much for the structures to withstand. Rolwaling Sangag Choling is a community-centered monastery and its history spans about nine generations. 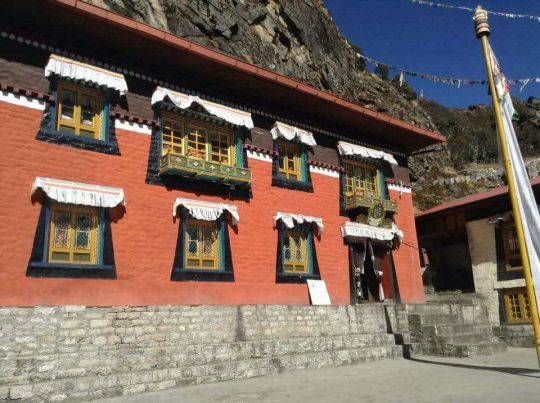 It is the only monastery in the entire community of Sherpa Buddhists.This monastery is particularly precious to FPMT as Lama Zopa Rinpoche attended this monastery between the ages of 7-12. Geshe Jinpa, a Kopan monk, is overseeing this project and seeing it through to finalization. This project not only included the new gompa. A two-storey kitchen was built with dining and lama rooms, a butter lamp house, and an office and storage building were completed. Additionally, a two-storey building has been built between the main gompa and kitchen containing a large prayer wheel beneath and a deity room upstairs; and a very strong stone gabion was built to protect the buildings from the river flowing past and to give a stable support for the structure and also provide an expansion of the courtyard so that more people can be accommodated during teachings and festivals. A passage and fence was built all around the gompa and premises. Damage to the Rolwaling gompa was extensive following the earthquake. 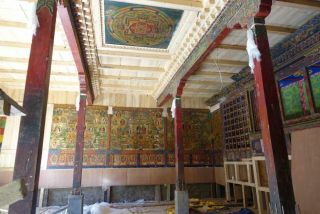 We are happy to report that a final grant has recently been offered toward the completion of this gompa. This gompa is the sole place in the area where daily prayers, offerings, pujas, retreats, Buddhist teachings, death and dying services, and community events for lay students and ordained Sangha (which can serve up to 300 people at once) are offered. Please rejoice in this offering made possible by this generous grant. The rebuilding of this gompa helps preserve the local culture and reestablish the monastery as a place for Buddhist practice and community. Some of the monks of Thame Monastery. 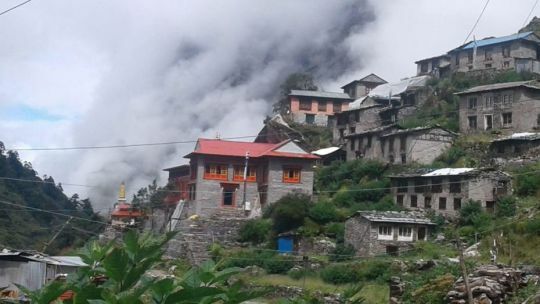 The Supporting Ordained Sangha Fund was very pleased to offer a grant for over US$10,000 to Thame Monastery in the Solo Khumbu District of Nepal. The grant will cover the cost of food for all the monks during 2018. The monastery houses nine elderly and thirteen young monks. Thame Monastery is one of the oldest in the region, and is famous for the annual Mani Rimdu Festival. Lama Zopa Rinpoche was born in Thame which is located very close to Lawudo. FPMT is very happy to support the Sangha of Thame through this offering of food, to contribute to holy object restoration in the area through a recent grant for a large stupa which is being rebuilt in the area, and through support following destruction due to the 2015 earthquake which devastated the area. Since 2009 sponsorship has been offered to the nuns of Tashi Chime Gatsal Nunnery, Nepal. Funds have been offered to complete two 100 million mani retreats (100 million recitations of the mantra OM MANI PADME HUM) every year. 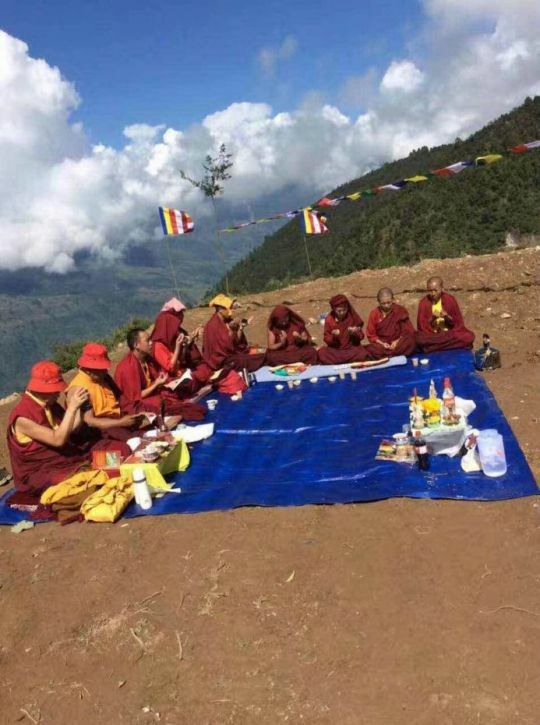 In addition to the 100 million mani retreats, offerings are made to cover the cost of food for all during this period as well as an offering for a qualified geshe to stay during the retreat in order to give lamrim teachings. Additionally, a grant was offered to the nunnery for much needed new accommodation in 2014. Extensive water bowls offered by the nuns of Tashi Chime Gatsal Nunnery. Tremendous thanks to all who donate to the Supporting Ordained Sangha Fund allowing support to this nunnery to continue uninterrupted. The monks of Sera Je Monastery will be offered three nutritious meals a day long into the future thanks to an endowment offered in 2017. 2017 was a momentous year for FPMT Charitable Projects. In January 2017 we raised the targeted amount needed to offer Sera Je Monastery an endowment fund large enough to support the daily food offering program at the monastery (known as the Sera Je Food Fund– providing nutritious meals daily to all of the monks studying at Sera Je). 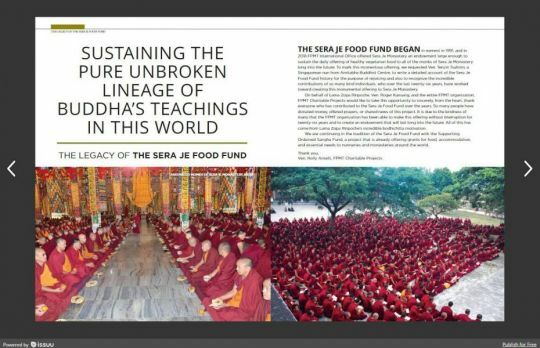 The Sera Je Food Fund, an FPMT Charitable Project from 1991-2017, has offered millions of meals since its inception. At the time of this fund becoming self-sufficient it was offering approximately 700,000 meals per year, 2,900 meals per day and the annual cost was US$200,000. MAITRI Charitable Trust provides essential education, medical care, aid to mothers and children, animal care, and various forms of charitable service to the destitute in Bodhgaya, India. 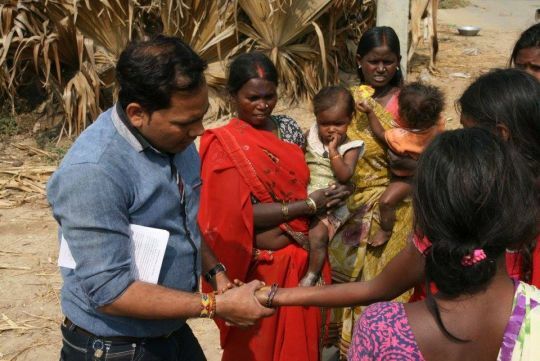 A grant was offered through the Social Services Fund to MAITRI Charitable Trust that will assist with providing essential education, medical care, aid to mothers and children, animal care, and various forms of charitable service to the destitute in Bodhgaya, India. The Holy Objects Fund offered grants toward the creation of large holy objects around the world including: a stupa for Tenzin Osel’s teacher Geshe Gendun Chomphel who passed away in 2016, prayer wheels for a Tibetan settlement in Bylakuppe, and the 28 ft x 6.5 ft umbrella of the Great Stupa of Universal Compassion, Bendigo, Australia, which will contain embossed mantras advised by Lama Zopa Rinpoche. Children of Sagarmatha Secondary School engaged in prayer. 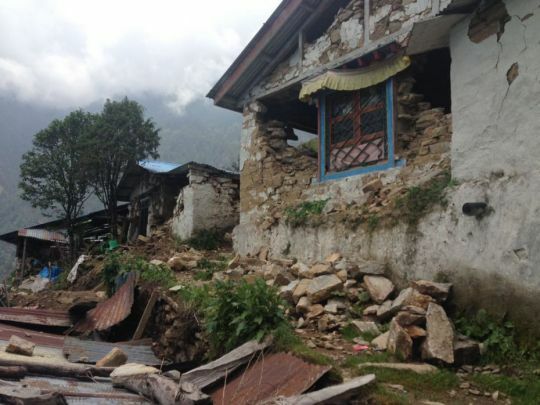 A grant was offered from the Social Services Fund for the complete rebuilding of Khumjung Gompa, Nepal, after destruction from the 2015 earthquake rendered it unusable. Approximately 4,000 local sherpas live in the area and about 300 households share this gompa for religious festivals. A grant was offered through the Social Services Fund to Sagarmatha Secondary School in Chailsa, Nepal for the operating budget of the school which currently serves 120 young students. The Puja Fund offers up to US$100,000 annually to 15,650 ordained Sangha who make substantial prayers and perform pujas and practices dedicated to the well-being of all and to world peace. Gold, saffron, precious paint and highest quality brocade are offered to the main holy objects in Nepal, India, and Tibet. These are just a few examples of the many grants offered in 2017. Please stay tuned for the release of FPMT International Office’s Annual Review which will contain more information on 2017’s incredible year of charitable giving. You can keep up on all of the grants being offered through FPMT Charitable Projects and get involved in supporting us in 2018.